Hello! Welcome to my quiz! Remember, if you enjoy this, click that smiley face! Enjoy and have fun! Also, I spent a lot of my time on this so please don't be mean. Hi! I hope you enjoyed! Here are my social medias: Instagram=seaveyhaleyyy Roblox=wolfylove5621 You can follow me and we can talk on Instagram!!!!!!!! What year did the band Why Don't We form? Which song is NOT created my Why Don't We? Which member loves to skateboard? Which member has a stuffed panda named Chubbs? Which member plays many instruments? 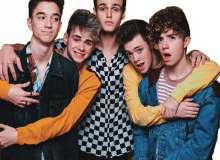 Where does Why Don't We live? Are all the members from the same state? How am I suppose to know that?! Quiz topic: Am I A True Limelight?